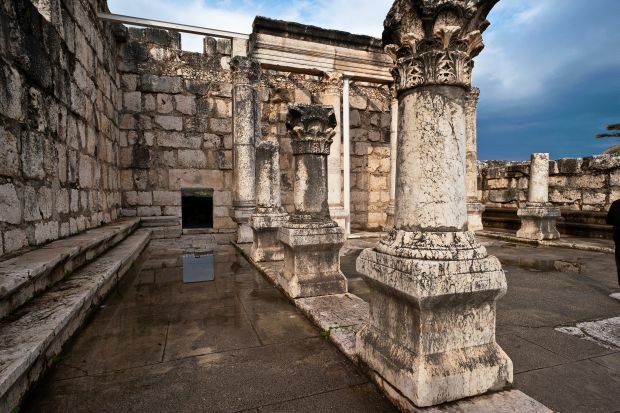 CAPERNAUM, Israel (CNS) – Walking amidst the white marble and limestone ruins of the fourth-century synagogue, the words of Jesus seem to reverberate through the town of Capernaum even today. “I am the bread of life; whoever comes to me will never hunger, and whoever believes in me will never thirst” (Jn. 6:35). It was on this holy site — a gathering place for discussion and prayer, according to Jewish tradition — where Jesus engaged the religious leaders and townspeople in a remarkable display of knowledge, courage and love of others. The ruins today encompass the original synagogue where Jesus is believed to have frequented, according to Scripture. Tradition holds that any new synagogue usually is built over the ruins of the old structure. Archaeologists and historians have uncovered key artifacts in the ruins dating to the time Jesus lived, giving credence to the belief that he ministered at this site. All four Gospels mention the synagogue. They describe with varying details how Jesus inspired those who gathered for prayer and conversation with new insights into the moral law passed down through Hebrew scripture. And it’s all freely and easily accessible to pilgrims following in Christ’s footsteps. The expansive synagogue is an archaeological wonder in itself. Visitors can examine up close the extensive ruins and its Roman architectural elements: tall ancient columns, architraves across the top of the columns, friezes (ornamental decorations on walls) and cornices. It was only in the 20th century that Capernaum rose again as a site for pilgrims to explore. Located on the northern shore of the Sea of Galilee, Kfar Nahum — as the city was known 2,000 years ago — was a fishing port and way station on the main trade route between the Mediterranean coast and Damascus, Syria. Around 700 the city was abandoned. The ruins remained virtually untouched for more than 1,100 years until they were discovered by explorer Eduard Robinson in 1838. Since then researchers and archaeologists have sought answers to enduring questions about the life of Christ. The Franciscans acquired the site in 1893 and began excavations that lasted through the early 20th century. A Franciscan monastery, built in 1894, stands at what is now the town’s gated main entrance. After the archaeological hiatus, excavations began anew in 1968 and continue to this day. The excavations have revealed the outlines of numerous homes constructed of gray basalt, a common rock in the area, numerous tools and an octagonal Byzantine church dating to the fifth century. Among the discoveries in 1968 was what is believed to be the home of St. Peter about 100 feet from the entrance to the synagogue. It was unearthed beneath the foundation of the Byzantine church among a group of homes. The discovery of various artifacts combined with scientific testing and research using several literary sources have led researchers to conclude that it is the likely site where St. Peter and his family lived. The confluence of structures is known as insula sacra, or holy insula. The term insula refers to a block of homes around a courtyard. Today, the octagonal Catholic Church of St. Peter’s House occupies the site. Built by the Franciscan Custody of the Holy Land and dedicated in 1990, the modern structure is modeled on a fishing boat. It incorporates expansive glass panes in its foundation, allowing visitors to peer into the home of the first apostle and see the excavation work that continues. Capernaum is also where Jesus chose his first four apostles. In addition to Simon Peter, Andrew and the two sons of Zebedee, James and John, became Jesus’ closest companions. A bigger-than-life statue memorializes Peter, the first pope, near the insula sacra. A small admission fee is required to enter the town. Parking is plentiful, but be prepared to walk several hundred feet to the entrance.